I recently analyzed some data trying to find a model that would explain body fat distribution as predicted by several blood biomarkers. I had more predictors than samples (p>n), and I didn't have a clue which variables, interactions, or quadratic terms made biological sense to put into a model. I then turned to a few data mining procedures that I learned about during grad school but never really used (LASSO, Random Forest, support vector machines, etc). So far, Random Forest is working unbelievably well. The boostrapping and aggregation ("bagging," i.e. the random component of Random Forest) avoids overfitting so well that I'm able to explain about 80% of the variation in an unseen sample using a model derived from only 30 training samples. (This paper offers the best explanation of Random Forest I've come across). 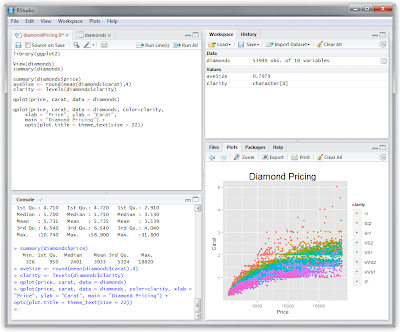 While doing this I needed to write an R function to split up a dataset into training and testing sets so I could train models on one half and test them on unseen data. I'm sure a function already exists to do something similar, but it was trivial enough to write a function to do it myself. This function takes a data frame and returns two dataframes (as a list), one called trainset, one called testset. 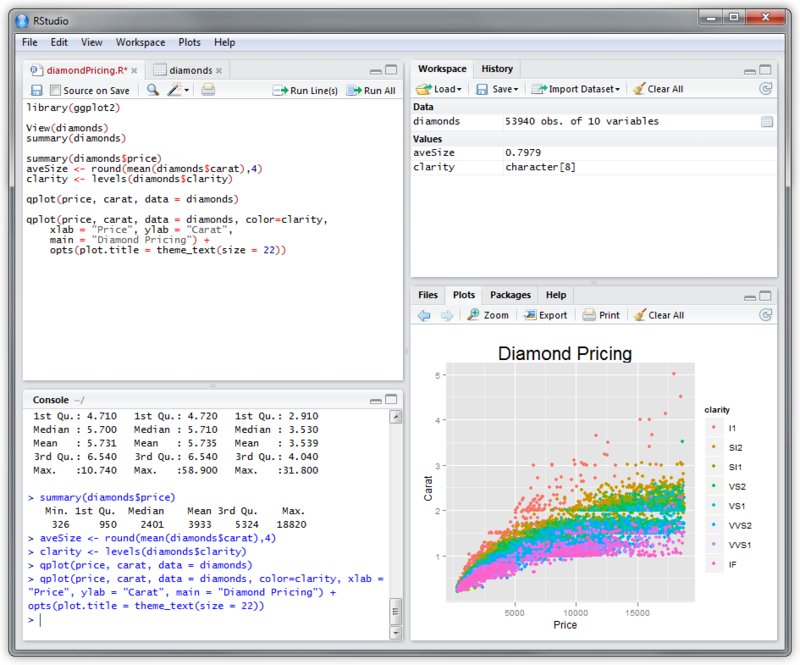 Here's some R code that uses the built in iris data, splits the dataset into training and testing sets, and develops a model to predict sepal length based on every other variable in the dataset using Random Forest. *Edit 2011-02-25* Thanks for all the comments. Clearly the split() function does something very similar to this, and the createDataPartition() function in the caret package does this too. When I have a question I usually ask the internet before bugging my neighbor. Yet it seems like Google's search results have become increasingly irrelevant over the last few years, and this is especially true for searching anything related to R (and previously mentioned Rseek.org doesn't really do the job I would expect it to do either). The last few years has seen the development of several community-powered Q&A websites, and I'm not talking about Yahoo Answers. Here are a few that come to mind that I've used and found extremely helpful. Biostar (biostars.org) - a Q&A site for bioinformatics. The site's focus is bioinformatics, computational genomics and biological data analysis. A few of my favorite threads from this site are one on mapping SNPs to pathways, and another on mapping SNPs to genes using tools like the UCSC public MySQL server. CrossValidated (http://stats.stackexchange.com/) - a Q&A site for for statisticians, data miners, and anyone else doing data analysis. This one's relatively new but already has many very talented and extremely helpful users. Last week I asked a question about R², about the difference between variance explained and variation explained, and how that related to Random Forests. The question was answered merely a few hours later. Finally, there's Quora (http://www.quora.com/). Quora's a little different from the others, and you can ask just about anything you want here. Quora's also still young, but seems to have lots of science/tech geeks like us using it. I recently asked a question, requesting a lay explanation of how Random Forest works, and got a great answer. There was also a good thread about whether current customers found 23andMe to be worth buying. There's an FAQ on all of these sites that explains how to ask a good question. You might even try answering a few questions yourself and find it rewarding. It's a lot like playing a game, with rather odd goals. You get reputation points and "badges" for answering questions, having your answers voted on, commenting on others' answers, etc. You'll also find that as your own reputation increases by providing good answers to others' questions, your own questions will be answered more quickly. If none of these are quite what you're looking for, check out the stackexchange directory. You'll find Q&A sites that all use the same engine dedicated to topics from photography or cooking to programming and web development. Something like this probably already exists in an R package somewhere out there, but I needed a function to summarize how much missing data I have in each variable of a data frame in R. Pass a data frame to this function and for each variable it'll give you the number of missing values, the total N, and the proportion missing. Running that function returns a list of data.frame objects. You can access the proportion missing for var1 by running propmiss(fakedata)$var1$propmis. A while back I asked you what reference management software you used, and how well you liked it. I received 180 responses, and here's what you said. 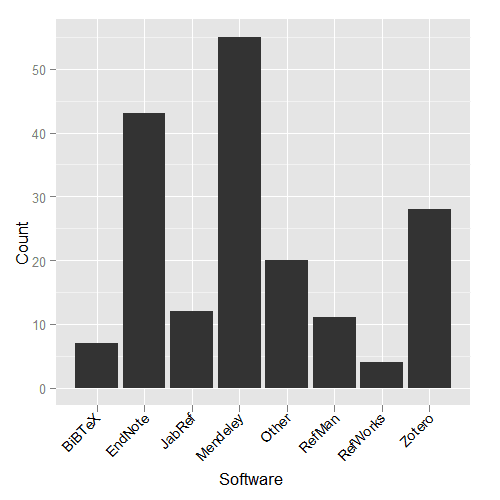 Out of the choices on the poll, most of you used Mendeley (30%), followed by EndNote (23%) and Zotero (15%). Out of those of you who picked "other," it was mostly Papers or Qiqqa. There were even a few brave souls managing references caveman-style, manually. 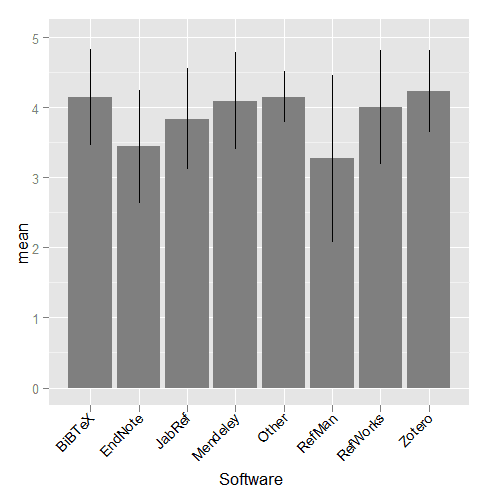 As for how much you are satisfied with the software you used, there wasn't much variation. If anything, users of EndNote or RefMan ranked their satisfaction slightly lower on average, but my n here is starting to get a little low. I've been using Mendeley for a few weeks now and like it so far as a replacement for RefMan. The MS Word integration works well, it can use all the EndNote formatting styles, and the online/social features are nice, even though I don't use them very often. Thanks for filling out the poll!